Schrödinger equation governs the world of chemistry and chemical science. This fact was known since the discovery of the Schroedinger equation in 1926. Despite of the efforts of many theoretical scientists, general method of solving the Schroedinger equation has not been found for 80 years. However, recently, this method was discovered by Dr. H. Nakatsuji in Kyoto. Among the several methods found by him, the most frequently used one is the free complement (FC) method. With the FC method, the so-called “complement functions” that span the exact wave function (the solution of the Schroedinger equation) are generated automatically by using the Hamiltonian of the system. So, all we have to do thereafter is to calculate the expansion coefficients ci and this is done with the variation method or the local Schroedinger equation (LSE) method. In the latter method, we use the local Schroedinger equations at several coordinates in molecules as the necessary conditions of the Schroedinger equation. A merit of the LSE method is that it is applicable even for the system whose complement functions are difficult for evaluating their integrals. Thus, the FC method is a general method for solving the Schroedinger equation. The Hamiltonian of the system involves all the information of the system and produces the complement functions that span the exact solution of the Schroedinger equation. So, thereafter, all we have to do is to calculate the expansion coefficients with the variation principle or the LSE method. It is a big challenging subject to develop an efficient methodology of the FC method that is applicable to a wide subject of chemistry and chemical science. This is actively studied in the laboratory of QCRI in Kyoto. Our project of solving the Schrödinger Equations was accepted as the TSUBAME Ground Challenge Program 2013 at Tokyo Institute of Technology, and the results were presented in SC13 at Denver, USA in 17-22, Nov. 2013. Click here to download the poster at SC13. Discovery of a General Method of Solving the Schrödinger and Dirac Equations That Opens a Way to Accurately Predictive Quantum Chemistry, H. Nakatsuji, Acc. Chem. Res., 45, 1480-1490 (2012). This article is ranked 4 in Most Read Articles in July 2012. Scaled Schrödinger Equation and the Exact Wave Function, H. Nakatsuji, Phys. Rev. Lett. 93, 030403 (2004). General Method of Analytically Solving the Schrödinger Equation of Atoms and Molecules, H. Nakatsuji, Phys. Rev. A, 72, 062110 (2005). Deepening and Extending the Quantum Principles in Chemistry, H. Nakatsuji, Bull. Chem. Soc. Jpn. 78, 1705 (2005). Analytically Solving the Dirac-Coulomb Equation for Atoms and Molecules, H. Nakatsuji H. Nakashima, Phys. Rev. Lett., 95, 050407 (2005). 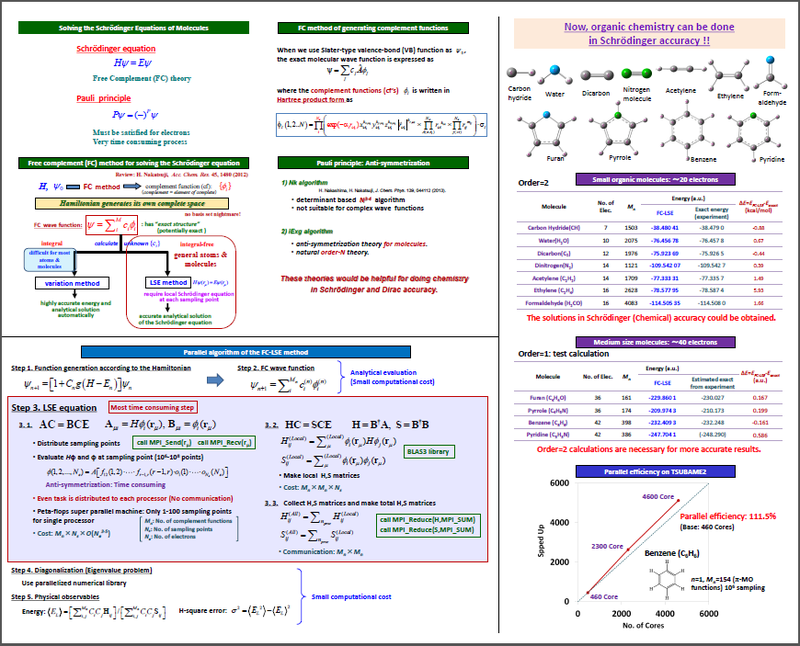 Free ICI (Iterative Complements Interaction) Calculations of Hydrogen Molecule, Y. Kurokawa, H. Nakashima, and H. Nakatsuji, Phys. Rev. A, 72, 062502 (2005). Structure of the Exact Wave Function, H. Nakatsuji, J. Chem. Phys., 113, 2949-2956 (2000). Structure of the Exact Wave Function. II. Iterative Configuration Interaction Method, H. Nakatsuji and E. R. Davidson, J. Chem. Phys. 115, 2000-2006 (2001). Structure of the Exact Wave Function. III. Exponential Ansatz, H. Nakatsuji, J. Chem. Phys., 115, 2465-2475 (2001). Structure of the Exact Wave Function. IV. Excited Sates from Exponential Ansatz and Comparative Calculations by the Iterative Configuration Interaction and Extended Coupled Cluster Theories, H. Nakatsuji, J. Chem. Phys., 116, 1811-1824 (2002). Structure of the Exact Wave Function. V. Iterative Configuration Interaction Method for Molecular Systems within Finite Basis, H. Nakatsuji and M. Ehara, J. Chem. Phys., 117, 9-12 (2002). Iterative CI General Singles and Doubles (ICIGSD) Method for Calculating the Exact Wave Functions of the Ground and Excited States of Molecules, H. Nakatsuji, M. Ehara, J. Chem. Phys. 112, 194108 (2005). Inverse Schrödinger Equation and the Exact Wave Function, H. Nakatsuji, Phys. Rev. A 65, 052122 (2002).